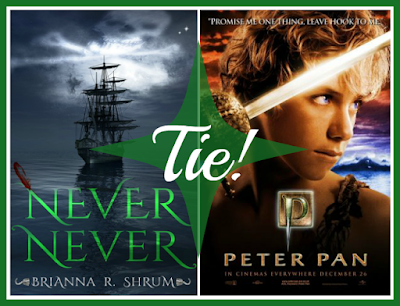 This week I'm featuring Never Never by Brianna R. Shrum, and the 2003 movie adaptation of Peter Pan, two extremely different retellings of a beloved classic. Peter Pan has always been one of my favorite stories. I enjoyed the Disney movie growing up and I've really enjoyed all of the newer iterations throughout the years. But... I have a sweet spot for villains and Captain Hook is no exception. So this book was right up my alley! Never Never tells the story of James Hook from the time he is a child until he is the captain of the Spanish Main. And it was basically perfect. 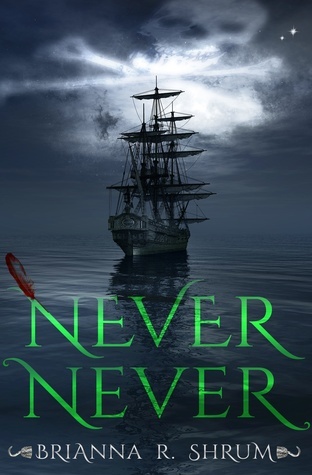 The first part of Never Never is the story of how James came to be in Neverland and covers much of his time as a Lost Boy. Almost immediately it is clear that Peter Pan is not just a carefree boy like he is often portrayed. He is much more sinister than that. But more than anything, Pan is a narcissist. He expects everything to go his way and has insane rules for his Lost Boys, going as far as demanding they not be taller than him! I immediately found myself sympathizing with James Hook and felt myself being confused right along with him about why everyone loved Peter. The next two parts of the book follow James as he slowly grows up and becomes Captain Hook. He seems to be in a constant state of despair at his continued existence in Neverland and is the only one of the Lost Boys who is unable to remain in perpetual childhood. I loved him. I fell in love with him through his childish nature and tears and loved him even more as he got older and turned to other means of existence. His inner turmoil was always apparent and entirely believable and I FELT for him in a way that I don't for many characters. This is really Captain Hook as you've never seen him before. Other familiar faces are also here. Smee and Tiger Lily are main characters in Never Never and play really interesting parts. I loved the romance between Tiger Lily and James. I could really feel their difficulties and actually felt like their angst worked in the story - it was believable. That didn't stop me from hating Tiger Lily a little bit as things happened, though. Neverland itself was also amazing. I loved visiting new places like the Neverwastes and even Keelhaul Island. There was something new and exciting around every corner that made a classic seem endlessly new and exciting. I also really enjoyed how the story was told. In the beginning it felt like a middle grade book, which then graduated to YA, and finally to what I felt was New Adult. The progression fit perfectly with the events. I just loved this story. I loved every single thing about it. I laughed and I (almost) cried. This is a story spanning several (Never)years, which allowed for everything to be extremely well developed and Brianna Shrum really did an amazing job with every single aspect. The ending came quickly and really blew me away, almost leaving me in tears. 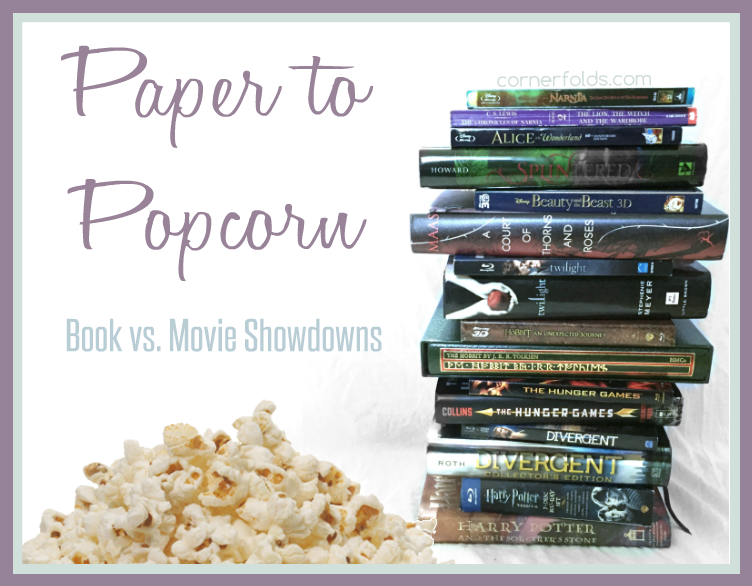 If you're a fan of Peter Pan (or Captain Hook, more precisely) please don't miss this book! In stifling Edwardian London, Wendy Darling mesmerizes her brothers every night with bedtime tales of swordplay, swashbuckling and the fearsome Captain Hook. But the children become the heroes of an even greater story, when Peter Pan flies into their nursery one night and leads them over moonlit rooftops through a galaxy of stars and to the lush jungles of Neverland. Wendy and her brothers join Peter and the Lost Boys in an exhilarating life--free of grown-up rules--while also facing the inevitable showdown with Hook and his bloodthirsty pirates. This movie. How did I go so long between viewings? I saw this when it came out on DVD back in 2004 and I remember enjoying it, but I didn't really give it a second thought. 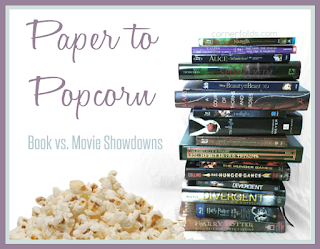 So when I decided to do a Paper to Popcorn post with Never Never I knew I wanted to give this one another watch since I literally remembered nothing about it. And it was amazing. Although I've never read the original Peter Pan book, I've read that this adaptation is the truest to the source material and that really makes me want to pick up the original because I love this story! Peter Pan tells the story with more of a focus on Wendy. Some of Pan's narcissistic attitude still shines through when he constantly forgets who other people are or throws a hissy fit when he doesn't get his way. Still, he's a character that I really did enjoy. I don't fully understand why he can't grow up (rather than won't) as the movie implies, but I did feel his uncertainty over what to do with his feelings for Wendy. I liked the romance between them and thought it was adorable and innocent, fitting their ages. I even liked Captain Hook (the fact that Lucius Malfoy is Hook didn't hurt). The cast is fantastic and this is truly a case when child actors shine! These films with children as main roles are SO hit or miss. Jeremy Sumpter and Rachel Hurd-Wood are amazing as Peter and Wendy! Even the horde of Lost Boys are spot on. I also loved the pirates! They were hilariously bad. I especially loved when they all crowded around to hear Wendy's stories! My favorite thing about this movie is that it is breathtakingly beautiful. From the moment the film began I knew it was going to be pure magic. There are scenes that are completely over the top with bright colors and obviously fantastical landscapes and they are perfect! Everything about the visuals in this movie just -works- and the CGI holds up amazingly well for a movie that's 12 years old. This is a heartwarming movie that will probably make you laugh and cry tears of joy! It's pure magic and is definitely my favorite Peter Pan adaptation. I truly cannot find one thing to complain about. Never Never is told from the perspective of James Hook, while Peter Pan focuses on events from Wendy's perspective. Wendy, John, and Michael only show up at the very end of Never Never. In Never Never James Hook is a Lost Boy for years, but in Peter Pan, Hook does not know how Peter flies, making it obvious that he was never a Lost Boy. Tiger Lily and Captain Hook have a romantic relationship in Never Never, but she is a little girl in Peter Pan, while Hook is an adult. Captain Hook's ship is called the Spanish Main in Never Never, but the Jolly Roger in Peter Pan. In Never Never Tootles is the smallest Lost Boy, but he seems to be one of the largest in Peter Pan. Many more deaths occur in Never Never than in Peter Pan. 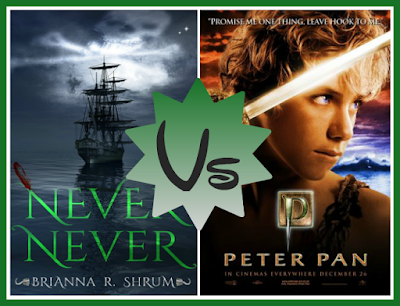 I hate to leave it at a tie, but both of these Peter Pan adaptations were perfect! You really can't go wrong with either one. If you're a villain sympathizer (like me) then Never Never is really an amazing book! Honestly, I think pretty much everyone will be able to sympathize with Hook after reading it. 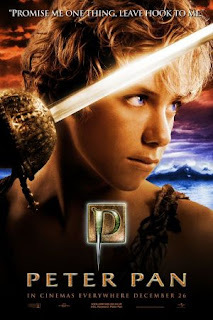 And if you're looking for a magical, uplifting movie experience, Peter Pan is a great choice!